Automatic Dry Syrup Powder Filling Machine is compact machine used for filling of the Dry Syrup in the bottles and is most ideal for wide application in PHARMA INDUSTRIES. It is built on strong and robust powder coated M.S. Angle frame Pipe Structure encompassed with S.S. coverings with matt-finish. The dried, sterilized and siliconised containers are fed through the Infeed Turn Table on to Infeed Delrin slat conveyor belt at required speed to the feed work for correct spacing between two bottles and get enter into the infeed starwheel. The infeed starwheel transfer the container below the funnel. The funnel plate with 16 nos. funnel mounted on it and the powder wheel is mounted on the centre pipe, which allows flexibility to adjust position of wheel as required and occupies less space on the machine. The machine has a lifter assembly on the base bottom of the plate. When the container comes below the funnel, the bottom platform lifts the bottle whereby the bottle gets inserted tight fit inside the funnel. The powder stored into the powder hopper is agitated by pair of mechanical agitators for maintain consistency and uniform bulk density, powder wheel rotates at the pre-set speed below the powder hopper with no clearance. Powder wheel consist of piston in each port and behind the powder wheel vacuum plate is provided and there is no clearance between powder wheel and vacuum plate due to back spring pressure. Precise volume of powder is sucked into the port of powder wheel during vacuum according to the piston length. The different fill volume can be achieved. The excess powder is doctored off by a doctor blade and now doctor blades can be adjusted from outside without removing power hopper. When powder wheel indexes further and remain in the pot due to the vacuum till it reaches just in vertical position, the time dose of compressed air, sterilized low pressure air or nitrogen gas sequentially flushes out powder from the port of powder wheel into the funnel. Funnel equipped with square rod to break solid slug of powder and power will start to fill inside the bottle which is moving along with funnel. The bottle is getting filled in around 5 to 6 seconds. The bottles further move with funnel and reaches to exit starwheel. After filling operation, filling head moves upward with help of cam and bottle enters into exit star wheel and move further on conveyor for next operation. Electrical Specifications** Main Machine and Conveyor 3 HP / 415Volts / 50 Hz. Net Weight 1500 KG Appro. Gross Weight 1800 KG Appro. Spring loaded Teflon top seal for powder hopper reduces the friction between powder wheel and top seal and avoid chance of white particle shading during operation. Adjustment of Doctor Blade and Wiper blade can made from outside without interrupting production saving time, powder wastage and chances of area condition disturbance. All drives through imported gear motor. 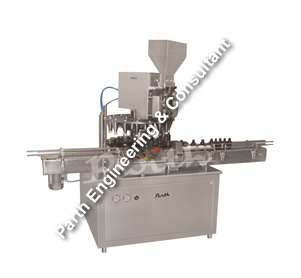 Machine is provided with delrin conveyor belt to avoid sticking of bottle on conveyor. Special clutch devices are provided on star wheel for safety purpose. Air filter of SS 316 housing with Nylon cartridge for proper removal of particle of 0.22 micron having 10” length. Vacuum filter of PVC transparent material with nylon cartridge f 10” length of 5 micron. Machine can fill 10 Gms to 50 Gms powder in single stroke. Safety guards for trouble free operational. Motorized height adjustable system for sealing unit.